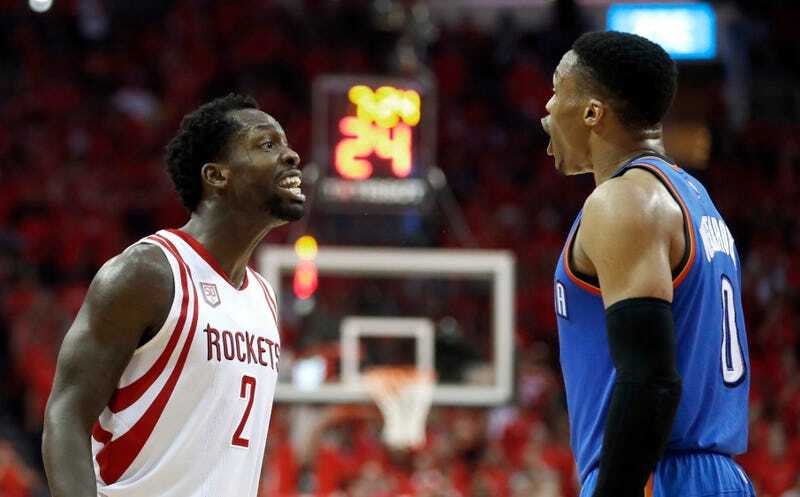 Patrick Beverley is a highly flammable substance, and last night Russell Westbrook, down by three and going out in a blaze of glory, lit him up. Maybe for old times’ sake. They then had a funny spat that produced some historically good Russ Faces. After that miserable fourth quarter lurched to its end and the Rockets closed out the series, Beverley explained what words the two had exchanged, and landed one last jab. That left Westbrook wondering if Beverley was delusional. —and Beverley returning the favor at one point during Game 5.